As Curiosity marks its fourth anniversary (in Earth years) since landing on Mars, the rover is working on collecting its 17th sample. While Curiosity explores Mars, gamers can join the fun via a new social media game, Mars Rover. On their mobile devices, players drive a rover through rough Martian terrain, challenging themselves to navigate and balance the rover while earning points along the way. The game also illustrates how NASA’s next Mars rover, in development for launch in 2020, will use radar to search for underground water. “We’re excited about a new way for people on the go to engage with Curiosity’s current adventures on Mars and future exploration by NASA’s Mars 2020 rover too,” said Michelle Viotti, manager of Mars public engagement initiatives at NASA’s Jet Propulsion Laboratory, Pasadena, Calif. “Using social networks, the user can share the fun with friends. The interest that is shared through gameplay also helps us open a door to deeper literacy in science, technology, engineering and mathematics.” JPL collaborated with GAMEE, a network for game-players, for development of the game, called Mars Rover. Mars Rover drivers wanted! Search for water as your game rover climbs up and down hills to explore Mars. Drive carefully! One crater crash, and it’s “game over” for your rover! Get the free app to play Mars Rover, and find out how the game rover compares to real Mars rovers. 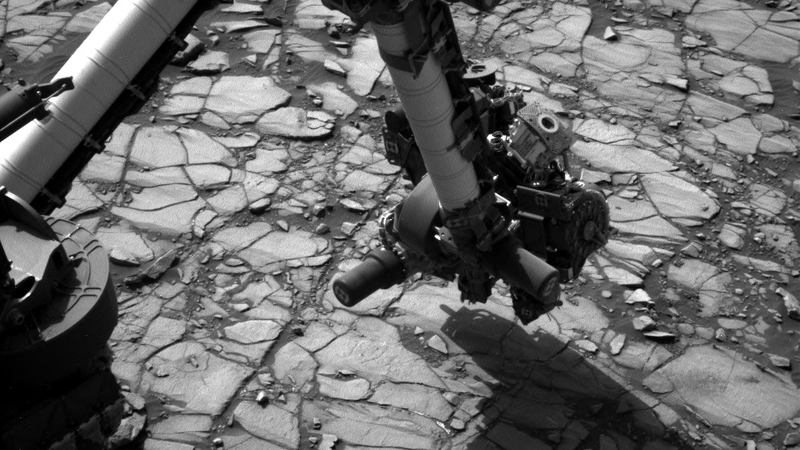 Meanwhile, on Mars the real rover has driven to position for drilling into a rock target called “Marimba,” to acquire rock powder for onboard laboratory analysis. The rover has begun a multi-month ascent of a mudstone geological unit as it heads toward higher and progressively younger geological evidence on Mount Sharp, including some rock types not yet explored. The mission is examining the lower slopes of Mount Sharp, a layered mountain inside Gale Crater, to learn more about how and when ancient environmental conditions in the area evolved from freshwater settings into conditions drier and less favorable for life. Six of the mission’s 13 drilled rock-samples so far, and two of its four scooped soil samples, have been collected since the third anniversary of landing. In its four years, Curiosity has returned more than 128,000 images and fired its laser more than 362,000 times. As of the fourth anniversary, Curiosity has driven 8.43 miles (13.57 kilometers). Curiosity landed inside Mars’ Gale Crater on Aug. 6, 2012, EDT (evening of Aug. 5, PDT), with a touchdown technique called the sky-crane maneuver. During the rover’s first Earth year on Mars, the mission accomplished its main goal when it found and examined an ancient habitable environment. Researchers determined that a freshwater lake at the “Yellowknife Bay” site billions of years ago offered the chemical ingredients and energy favorable for supporting microbial life, if life has ever existed on Mars. NASA’s orbiters and rovers at Mars enable continued scientific discoveries and prepare the way for future astronauts to explore the Red Planet. 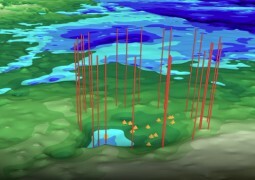 The crater, which has a width of over 22 miles, could be the 22nd largest impact crater found on Earth.